Reksten TR, Brokstad KA, Jonsson R, Brun JG, Jonsson MV. Int Immunopharmacol. 2011 Dec;11(12):2125-9. doi: 10.1016/j.intimp.2011.09.006. 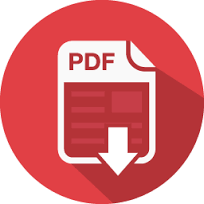 Epub 2011 Sep 29. 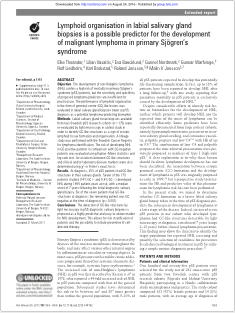 Lymphoid organisation in labial salivary gland biopsies is a possible predictor for the development of malignant lymphoma in primary Sjögren's syndrome. Theander E, Vasaitis L, Baecklund E, Nordmark G, Warfvinge G, Liedholm R, Brokstad K, Jonsson R, Jonsson MV. Ann Rheum Dis. 2011 Aug;70(8):1363-8. doi: 10.1136/ard.2010.144782. 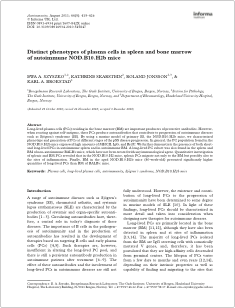 Distinct phenotypes of plasma cells in spleen and bone marrow of autoimmune NOD.B10.H2b mice. Szyszko EA, Skarstein K, Jonsson R, Brokstad KA. Autoimmunity. 2011 Aug;44(5):415-26. doi: 10.3109/08916934.2010.545847. Epub 2011 Feb 21. 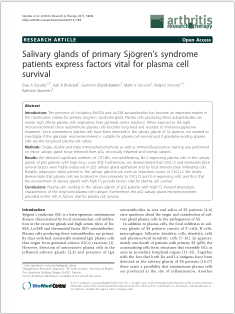 Salivary glands of primary Sjögren's syndrome patients express factors vital for plasma cell survival. 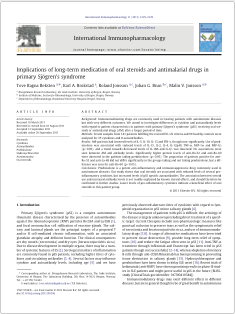 Szyszko EA, Brokstad KA, Oijordsbakken G, Jonsson MV, Jonsson R, Skarstein K.
Arthritis Res Ther. 2011 Jan 7;13(1):R2. doi: 10.1186/ar3220. 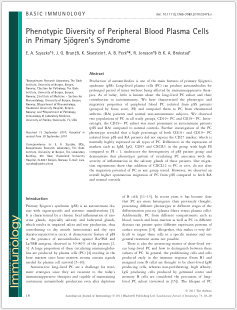 Phenotypic diversity of peripheral blood plasma cells in primary Sjögren's syndrome. Szyszko EA, Brun JG, Skarstein K, Peck AB, Jonsson R, Brokstad KA. Scand J Immunol. 2011 Jan;73(1):18-28. doi: 10.1111/j.1365-3083.2010.02475.x.